It may seem impossible that flowering trees can survive the extreme, punishing winters of USDA Plant Hardiness Zone 4. However, there are several rugged, but beautiful trees that will not only tolerate temperatures that drop as low as -35 degrees Fahrenheit, but will thrive, welcoming spring with bursts of bright color. Tulip poplar (Liriodendron tulipifera), is a hardy tree with a sturdy, straight trunk and a rounded top. Tulip poplars supply welcome shade on hot days, as they grow to heights of 40 to 100 feet, with a 20- to 40-foot spread. In late spring, the large greenish-yellow and orange, tulip-shaped flowers will attract butterflies and hummingbirds. In autumn, the yellow leaves add color to the landscape. Plant tulip poplar trees in moist, well-drained soil and full sunlight. 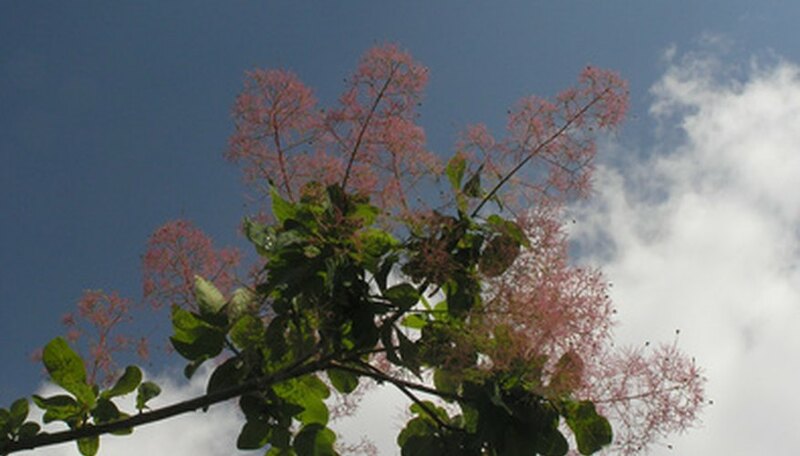 Smoke tree (Cotinus coggygria), is a rounded, shrubby, mid-size tree that will reach heights of 10 to 15 feet at maturity. In spring, the smoke tree will burst out with fluffy masses of pale pink flowers that resemble smoke. In autumn, the leaves liven up the landscape, turning vivid shades of red, yellow and purple. Smoke tree will grow in nearly any well-drained soil, but needs full sunlight. Siberian crabapple (Malus baccata), is an attractive tree with a rounded shape that will ultimately reach heights of 20 to 50 feet. In spring, the Siberian crabapple will be covered with masses of fragrant, pink blooms that soon turn white. The blooms will be replaced by brighty-colored yellow or red fruit that will make hungry birds very happy. Siberian crabapple is tolerant of poor soil as long as it drains well, but requires full sunlight in order to thrive. Eastern redbud (Cercis canadensis), will welcome spring every year with showy clusters of bright, purple-pink blooms that appear just before the emergence of the leaves. In summer, the eastern redbud will produce green bean-like pods that turn brown as the pods mature. In autumn, the leaves turn bright yellow. The eastern redbud has an interesting, twisted trunk, and at maturity, will grow to heights of 20 to 30 feet. Although it prefers full sunlight, eastern redbud will tolerate partial shade.